In the Messianic Era, when the true Divine nature of every creature will be openly revealed, the pig will stand vindicated as a kosher animal. Because with all its posing and prancing, the pig does one thing for us. It forces us to confront our own insidious evil nature, combat it, and ultimately rise above it. The above partial quote on the book cover shows the deceptive nature of such quoting and quotations. 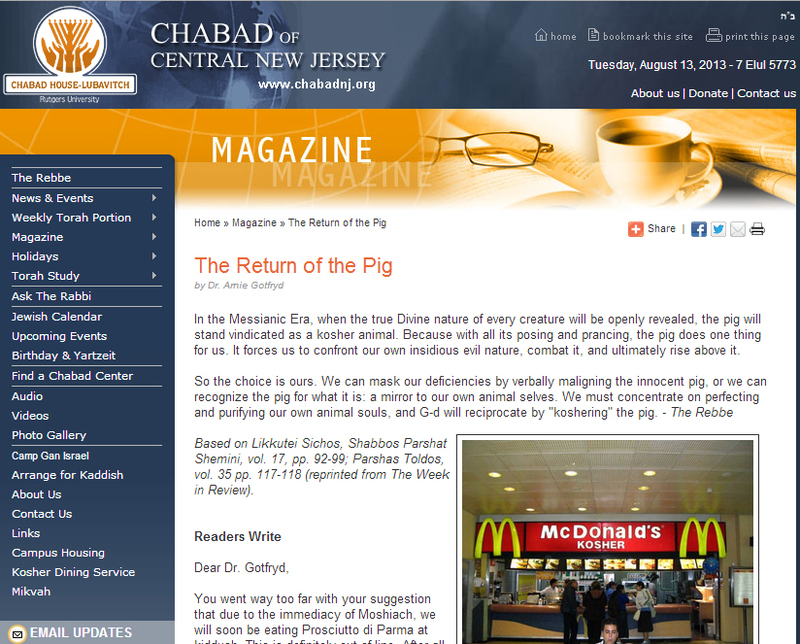 The Lubavicher Rebbe is making the connection between the hypocrisy of the pig and the mirror to our own animal selves. Nowhere is there a connection between any Messiah and a pig in any writings of the Lubavicher Rebbe and/ or the writings of the Sages. For more information about this deception you can find out by clicking here. Nu, and you thought he would actually put the full quotation? Just another proof that he does not know as much as he claims. I cannot deal with his deliberate dishonesty which I think is even worse.